Bloomsbury Publishing PLC, 9781608197163, 261pp. More than ten people are murdered every day in Ciudad Juarez, a city about the size of Philadelphia. As Mexico has descended into a feudal narco-state-one where cartels, death squads, the army, and local police all fight over billions of dollars in profits from drug and human trafficking-the border city of Juarez has been hit hardest of all. And yet, more than a million people still live there. They even love their impoverished city, proudly repeating its mantra: "Amor por Juarez." Nothing exemplifies the spirit and hope of Juarenses more than the Indios, the city's beloved but hard-luck soccer team. Sport may seem a meager distraction, but to many it's a lifeline. It drew charismatic American midfielder Marco Vidal back from Dallas to achieve the athletic dreams of his Mexican father. Team owner Francisco Ibarra and Mayor Jose Reyes Ferriz both thrive on soccer. So does the dubiously named crew of Indios fans, El Kartel. 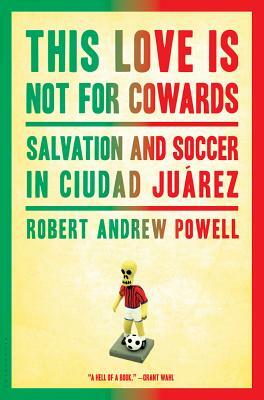 In this honest, unflinching, and powerful book, Robert Andrew Powell chronicles a season of soccer in this treacherous city just across the Rio Grande, and the moments of pain, longing, and redemption along the way. As he travels across Mexico with the team, Powell reflects on this struggling nation and its watchful neighbor to the north. This story is not just about sports, or even community, but the strength of humanity in a place where chaos reigns. Robert Andrew Powell is the author of "We Own This Game" (Grove/Atlantic, 2003), a story of race, politics and football in Miami. The book was excerpted in Sports Illustrated; the magazine later named it one of the Best Books of 2003. His journalism has appeared in the New York Times, the New York Times Magazine, Play, Slate, Mother Jones, Inc., 5280, Sports Illustrated, Runner's World, the Kansas City Star, on public radio's "This American Life with Ira Glass," and in the "Best American Sports Writing" anthology. He also produced a documentary film, "Year of the Bull," which first aired on Showtime. He has won a James Beard Award for his food writing and twice been a finalist for the Livingston Award. He lives in Miami.